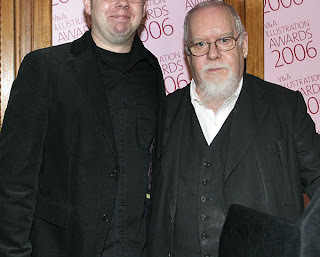 Usually nonchalant in such situations, I was un-characteristically wobbly when meeting Peter Blake at the V&A Illustration awards the other day. Although nerves prevented me from embarrassingly blurting Peter into a corner of the gallery with a tirade of superlative praise (thank god), it was a bit fantastic to meet a British artist of such standing. The only shame of the evening is that the 2nd prize for book cover illustration wasn't 'a nice new jaw' - given that (looking at the photo) I seem to have half a dozen fleshy rolls of flab under-hanging my (smirking) mouth, that tower over Mr Blake like a duvet of freshly fallen (slightly sweaty and bristled) snow. Thankfully the subsequent polite applause was not enough to trigger an avalanche, jepodising the national treasure smiling to my left - (oblivious to the fate of 'burial by chins' that very nearly was his). Thanks to Annemarie for the photo (since cropped to key areas of interest).